Jewellers, Goldsmiths, and Opticians, etc., 1, Nanking Road, Shanghai. The watchmaking and jewellery trade is one of the avocations in Shanghai in which there is great competition, judging by the number and character of the establishments devoted thereto; consequently, the demand for such luxuries as articles of gold and silver and precious stones which sustains them is significant of local prosperity. One of the best firms in this line is that of Messrs. Hirsbrunner and Co., who have occupied a prominent position therein since the commencement of their business in 1870. Their large premises at No. 1, Nanking Road are fitted up in a very elegant manner, the numerous show cases and other appointments enabling the firm to display their stock in a system of orderliness that cannot fail to be admired, and which admits inspection of each article without any inconvenience or trouble to either buyer or seller. To the visitor on the look-out for beautiful and uncommon designs in jewellery, Messrs. Hirsbrunner and Co.'s stock will specially appeal, the variety being so large that requirements of any description cannot fail to be satisfied. The assortment of watches and clocks represent the highest achievements attained therein by the leading makers throughout the world, and illustrates the perfection to which their manufacture has been brought. But if any department of the business is worthy of greater eulogy than another, it is that directed to nautical and surveying instruments. Admiralty charts, optical goods, etc., which are held in great abundance. Everyone versed in these articles knows, of course, that Messrs. Negretti and Zambra, London, are the leading firm operating therein in the world. The mere mention of the fact that Messrs. Hirsbrunner and Co. are sole agents for them is sufficient to convey some idea of the quality and variety of their stock in this direction, and the skilled staff in their operative departments includes a specialist brought out from Negretti and Zambra's for the execution of work beyond the capacity of the ordinary employee. In 1893 the concern came into the possession of Mr. P. Zurn, under whose able direction it has gained in the confidence and esteem of everyone having dealings with it. Jeweller, Gold and Silversmith, and Dealer in Chinese Art Goods, etc., 21, Nanking Road, Shanghai. Probably no shops are more interesting to the stranger than the handsome ones in which certain prominent Chinese firms deal in the various art goods of the Empire. One of the best of these is that belonging to Mr. Cheong Shing, which should be visited by everyone on the outlook for choice specimens of jewellery, gold or silver work, porcelain, lacquered ware, silk handkerchiefs and silk dress materials, embroideries, ivory goods, or any of the many articles for which the Chinese are noted. All the silks and embroideries displayed are the productions of Mr. Cheong Shing's establishment in Canton, and cannot fail to win the encomiums of the most expert connoisseurs. Japanese as well as Chinese curios are also held in abundance, while there is an excellent variety of European black wood furniture. Mr. Cheong Shing's establishment, which has two floors devoted to its purposes, is artistically and elegantly appointed, and the arrangement and display of the stock could not be improved. He has been established in Shanghai for about twenty years, and commands the respect of the entire community for his honourable and straightforward dealings. Chronometer Makers, Watchmakers, and Jewellers. Alexandra Buildings, Chater Road, Hong Kong. It is interesting to note that as years go by the wants of the inhabitants of even the most distant parts of the world are steadily increasing, and while the older generations were satisfied with comparatively little in the way of luxuries, the rising generation look upon many of these luxuries as necessities. Perhaps one of the best examples in this respect is the demand for jewellery, and in Hong Kong this trade has very able representatives in Messrs. Chs. J. Gaupp and Co. Their establishment is one of the finest of its kind in the East, and its large plate-glass windows display an artistic assortment of the many precious and useful articles in which the firm deal. To attempt a description of the beautiful stock within the shop itself would be idle, not to say Quixotic, in a necessarily brief commercial review. We can only say that from the nature of its rich and varied contents, the handsome character of the internal appointments, and the system that obtains in the arrangement of the goods, the establishment is characterised by all those up-to-date features associated with large contemporary houses in Europe. Here may be found everything that comes within the scope of the watchmaker, jeweller, goldsmith, silversmith, and optician. Every article supplied, whether it be in watches or clocks, in gems, in the precious metals made up into various forms, or in electro-plated ware fashioned with equal cunning and skill, is fully guaranteed as to quality. The firm do not compete in the matter of prices with houses dealing in goods of an inferior character, but they are fully prepared to enter the lists with any firm in the Orient dealing in precisely the same class of articles, and are in a position to offer to their patrons advantages which they will find impossible to improve locally. In their operative departments, which comprise the making and repairing of chronometers and all nautical instruments, Messrs. Chs. J. Gaupp and Co. turn out work of the highest order, and leave nothing undone to enhance process and result. The firm are agents for the British Admiralty Charts. The business was started in 1860 by Mr. C. J. Gaupp, from whom it passed five years thereafter into the hands of its present proprietors, Messrs. C. Hermann. P. E. Hermann, and O. Wagner, under whose able direction it has developed very considerably, and become one of the most noteworthy concerns in Hong Kong. Chas. 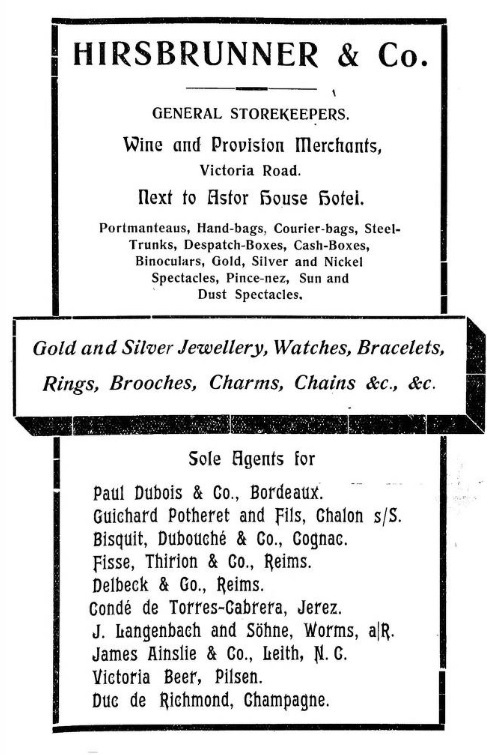 J. Gaupp & Co. opened a branch of their business in Singapore in 1913, under the management of C. Bunje. Charles Gaupp was an assistant at the firm of Louis Heermann, Gaupp took over the business when Heermann left Hong Kong in 1860. This German owned business was liquidated in 1914, most likely due to the outbreak of hostilities between Great Britain and Germany. German subjects were interned at Hong Kong as from October 1914. Watchmakers and Jewellers, etc., Hotel Mansions, Hong Kong. In endeavouring to impart an idea of the commercial activity in Hong Kong reference must be made to Messrs. G. Falconer and Co., watchmakers and jewellers,, whose business, started in 1855, is the oldest of its kind in the Colony. The firm were formerly in Queen's Road, and on the completion of the Hotel Mansions in 1905, removed into their present handsome establishment, which, as it is only a few steps from the landing stage, is sure to attract the attention of visitors. Its nice glass frontage illustrates very artistic and effective methods of window dressing, and due advantage is taken of the interior to exhibit the wealth of beautiful and serviceable articles in which the firm deal. The increasing production and cheapening of watches is one of the commercial phenomena, and the variety of their designs and qualities finds demonstration in the extensive assortment which Messrs. G. Falconer and Co. hold, ranging from serviceable articles of low price to very valuable specimens that only the wealthy can purchase. Their exhibition of brooches, bracelets, pins, rings, etc., is particularly interesting. Magnificent presentation plate and clocks of all kinds can also be procured here at thoroughly moderate prices. An important section of the business is that devoted to chronometers and nautical instruments of every description, and in the operative departments work is produced equal to anything of the kind that can be procured in Europe. Needless to say the firm's skill in this direction is greatly appreciated and taken advantage of. Messrs. G. Falconer and Co., we may add, are agents for Ross's famous telescopes and binoculars, Lord Kelvin's nautical instruments, the Admiralty charts and books, and sole agents for the Empire Typewriter. Falconer & Co. remained under the management of the Falconer family until 1997 when it was sold to the Lee Hing Group. The Falconer jewellery shop is now based in the Peninsula Hotel. Some detail of the the forerunner of George Falconer & Co., that of Douglas Lapraik & Co., can be found below. Falconer the jeweller's, which is but a trifle more showy than the rest, looks like an establishment in the heart of Bond Street. Watchmakers and Jewellers, Queen's Road, Hong Kong. Visitors to Hong Kong cannot fail to be very agreeably surprised at the metropolitan aspect of many of the shops. Among the most noteworthy of these is the one in Queen's Road where Messrs. Sennet Freres transact in a thoroughly up-to-date manner the various operations pertaining to the watchmaking and jewellery trade. An inspection of their extensive stock will well repay any one on the outlook for pretty and novel designs in jewellery, for it embraces anything and everything that can be asked for in that direction. Bracelets, brooches, pins, rings, and trinkets are shown in a variety that must create sometimes considerable difficulty in the matter of choice. All the precious stones are to be found here worked up into captivating souvenirs or presents suitable for every occasion and purpose. The firm's stock of watches is an object lesson in the many different kinds on the market, and is well calculated to satisfy the requirements of all classes of the community, ranging, as it does, from plain but useful time-keepers to specimens of fine art, workmanship, and material. As to clocks the firm's assortment may be taken as representative of the best and most effective on the market. But if there is any class of goods more worthy of encomiums than another it is their splendid collection of beautiful electric lamps, which embody art patterns of the highest order. Gramophones and fancy goods likewise figure largely in the stock. Messrs. Sennet Freres are one of the largest and best known firms in- the watchmaking and jewellery trade in the East. Their headquarters are at 32, Rue d'Hauteville, Paris, and they have branches at Shanghai, Tientsin, Harbin, and Vladivostock. The Hong Kong concern, which was taken over by the firm from its original owner, Mr. Levy Hermanos, is under the management of Mr. A. Weill, whose long experience and extensive knowledge of the trade well qualify him for the position. Watchmakers, Jewellers, and Dealers in Motor Cars, etc., 38, Nanking Road, Shanghai. Messrs. Sennet Freres are one of the largest, oldest, and best-known firms in the watchmaking and jewellery trade in the East. Their headquarters are in Paris, and they have branches at Hong Kong. Tientsin, Harbin, and Vladivostock. Visitors to Shanghai cannot fail to be agreeably surprised at the metropolitan aspect of the firm's establishment at 38, Nanking Road. It is appointed in an elaborate and artistic manner, and an inspection of the stock will well repay anyone on the outlook for pretty and novel designs in jewellery, for it embraces anything and everything that can be asked for in that direction. Bracelets, brooches, pins, rings, and trinkets are shown in a variety that must create considerable difficulty in the matter of choice. All the precious stones are to be found here worked up into captivating souvenirs or presents, suitable for every occasion and purpose. The firm's stock of watches is an object lesson in the many different kinds on the market, and is well calculated to satisfy the requirements of all classes of the community, ranging, as it does, from plain but useful timekeepers to specimens of fine art, workmanship, and material. As to clocks, the firm's assortment may be taken as representative of the best and most effective on the market. They hold, also, a splendid collection of beautiful electric lamps, which embody art patterns of the highest order. 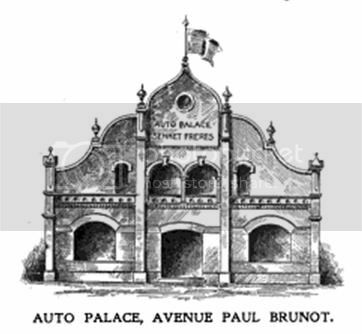 The firm also deal in motor cars, and at the time of our visit were erecting a new garage, called the Auto Palace, in the Avenue Paul Brunot. Our illustration of this garage is taken from the architect's plan. The Auto Palace is equipped with the latest machinery for effecting repairs of every description with the utmost skill and promptitude. The stock in it comprises the celebrated Brasier cars–ten to twelve horsepower–and their extreme popularity is evidenced by the large number which the firm have sold in the town. Messrs. Sennet Freres are also suppliers of the various cinematographs in operation locally. The Shanghai business has been established since 1895. and under the capable direction of Mr. A. Baumann enhances the good reputation which the firm enjoy. Sennet Freres opened a branch of their business in Peking in 1908. 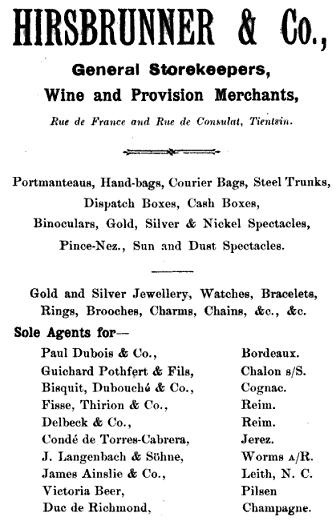 A Mr Dubois, formerly a manager of J Ullman & Co., was appointed manager of Sennet Freres Shanghai branch c.1940. Jewellers, Gold and Silversmiths, etc., 11B, Nanking Road, Shanghai. The wonderful proficiency of the Chinese in the manufacture of gold and silver work, jewellery, ivory carvings, black wood and inlaid furniture, silk, embroidery, etc., finds, an excellent demonstration in the large stock in the premises of Messrs. Hung Chong and Co. The range of beautiful articles exhibited here is an epitome of the highest achievements of Chinese skill and art, and affords a splendid selection to those on the outlook for choice specimens of the most superior goods associated with the race. Here can be obtained articles which the best connoisseurs would value, while there is. a great abundance of wonderfully cheap curios and fancy goods of all kinds within the reach of the most limited exchequers, and eminently suitable for birthday or wedding presents. The stock is submitted to inspection in a system of orderliness that cannot fail to be admired, and the handsome showcases and other equipment impart to the establishment an elegance thoroughly in keeping with its rich and lovely contents. Messrs. Hung Chong and Co. have been established about fourteen years, and by their straightforward dealings and honourable records have proved themselves a firm from whom the public can purchase with the fullest confidence of receiving good value for every dollar spent. The Chinese are admittedly clever craftsmen, and the silver-ware which they manufacture is very popular with collectors of Eastern curios and souvenirs, by reason of its quaint beauty. Among the leading gold and silver smiths in Shanghai are Messrs. Hung Chong & Co., who deal largely, also, in blackwood furniture, embroideries, silk piece goods, &c. Their premises at No. 11B, Nanking Road, always present a very attractive appearance. The business was established in 1892 by Mr. Fok Ying Chew, who sold it in 1906 to the present proprietor, Mr. Sum Luen-sing. The large trade now carried on necessitates the employment of fourteen assistants and forty workmen. Mr. Sum Luen-sing is the son of Mr. Sum Cheuk Sing, and was born in Macao in 1871. He studied English in Shanghai, and at the age of sixteen joined the " Limpu" line of steamers. Alter remaining in this employment for three years, he obtained a post with the "Kangyue" line. He joined Hung Chong & Co., as an assistant, in 1892. He is married, and has one son and daughter. Later mark of Hung Chong & Co.
Pearl and Diamond Merchants, Watchmakers and Jewellers, 48, Nanking Road, Shanghai. The metropolitan aspect of some of the shops in Shanghai is a subject of no small surprise to the visitor and a matter of congratulation to the residents. One of the most noteworthy establishments is the large and handsome one in which Messrs. Hope Brothers and Co., Ltd., transact all the operations incidental to the watchmaking and jewellery trade. The many beautiful and precious articles which are artistically and effectively displayed in its extensive windows (extending about 150 feet) are a neverfailing source of interest to passers-by, and, doubtless, a source of envy to firms with more restricted facilities and less attractive goods. But while the external appearance of the premises is so pleasing, that of the interior is still better calculated to impress the visitor. Here are to be found innumerable specimens of high art in gold, silver, and precious stones, in bronze, marble, crystal, and in all the most valuable materials. During our inspection we noticed in one of the many showcases a string of 200 pearls marked at 94,000 dollars! As a matter of fact, the firm's stock of pearls is reckoned the finest in the Orient. Their display of diamonds, sapphires, rubies, jade, and other stones is also remarkable, and they illustrate chaste and novel designs in the manufacture of jewellery. Watches and clocks are shown in a variety that should satisfy the most fastidious or extensive demands, and should be viewed by all desirous of obtaining something out of the common–a time-keeper that will not only faithfully record the passing minutes and hours, but will combine those novel and ornamental features which the leading manufacturers are ever striving to enhance in their best productions. The firm's display of bronzes with electric lights is uncommon, and those whose requirements tend in that direction will find, in the event of their visiting the establishment, a difficulty in resisting the many beautiful examples of art and utility which it contains. Musical boxes, gramaphones, optical instruments, and fancy goods add also to the interest and attraction of the stock. The business has been established since 1905, and the able manner in which it is conducted could not be improved. Chronometer and Watchmakers, Jewellers and Opticians. 564, Nanking Road, Shanghai. The liking for personal ornamentation with costly materials is one of the strongest traits of human character, so that there is no establishment which appeals more to the average man or woman than a jeweller's. In this direction the people of Shanghai are well catered for by Messrs. J. Ullmann and Co., whose establishment fulfils the most acceptable ideals of the trade. Its extensive and varied stock is artistically and methodically arranged, and affords a wide field for selection. The young man desirous of obtaining "something out of the common" in an engagement ring, or the happy individual whose sentiment seeks expression in the purchase of that plain little circlet of gold which religious and secular laws render imperative, are frequent visitors to the establishment, in which the extensive collection displayed is well calculated to meet the requirements of the most fastidious individual who ever sought to captivate and retain a lady's heart. And should he be of a romantic turn of mind, the firm will engrave at his request a pretty and appropriate motto on his purchase with the utmost expedition and proficiency. Brooches, bracelets, and watches of the most novel and artistic designs are also displayed in such abundant variety that his finances must indeed be in a state inconsistent with the approaching momentous event if he does not succumb to their attractions and leave the place with more extensive purchases than were intended on first entering. The shop is also a popular resort of ladies on the look-out for the most acceptable present for beau or relative, and the firm's assortment of articles of jewellery which "the lord of creation" most appreciates, such as scarf pins, watch chains, studs, links, cigar and cigarette cases, etc., would be difficult to surpass. Magnificent presentation plate is also on view, while the display of clocks indicates the efforts which are being put forth by the manufacturers towards the attainment of the highest standard in the ornamentation and utility of their productions. Beautiful Viennese mirrors, gramaphones, musical boxes, and other articles add also to the interest of the stock. The business was started in a small way in 1860 in Hong Kong by Mr. J. Ullmann, and has undergone great development. Besides their Shanghai and Hong Kong branches the firm have another in Tientsin, and a large factory at Chauxde-Fonds, Switzerland. The personnel of the firm comprises Mr. M. Bernheim, who controls the Shanghai business, B. Bernheim, who looks after the one in Hong Kong, and Mr. J. Ullmann, who attends to the manufacturing operations at Chauxde-Fonds. New Building, Tientsin:-A steady transformation is beginning to be made in the Rue de France, the main street In the French Concession. One of the more important of the new stores about to be built is that of Messrs. Ullmann and Company, jewellers. It will have a frontage of twenty-two metres with four show windows, next door to Messrs. Mondou and Company, and opposite the American Trading Company, it is expected to be completed about the end of this year. The foundations have just been laid. The designs are by Messrs. Carrey and Convorsy, the French Architects. Watch and Chronometer Makers, Jewellers: and Opticians. 23, Nanking Road, Shanghai. A Review of the business activity of Shanghai brings to light the keen competition that exists in the watchmaking and jewellery trade. One of the best-known firms engaged therein is that of Messrs. C. Ismer and Co., who have been established here since 1886, and whose work is on a par with anything similar procurable in the leading European and American contemporary establishments. A non-reflective individual inspecting Messrs. C. Ismer and Co.'s shop would regard it merely as an ordinary up-to-date emporium for the sale of the various articles pertaining to the avocation, but to one on a higher mental plane the wealth and variety of its stock would afford many subjects of interest and instruction. The firm's collection of watches, for instance, is an eloquent testimony to the large variety on the market, and their remarkable cheapness in comparison with the prices which similar specimens fetched in former years. Their assortment of clocks indicates the efforts which are being put forth by the manufacturers towards the attainment of the highest standard in the ornamentation and utility of their productions, while on their variety of nautical and optical goods many pages could be written regarding the researches, experiments, and discoveries which evolved them. Jewellery of all kinds is also stocked. Repairs of every description are executed with the utmost promptitude, and with a skill that would be difficult to excel. The partners are Mr. C. Ismer and Mr. C. Treppenhauer, who have spent their lives in the study and practice of their avocation. They are, therefore, experts in everything pertaining thereto, and personally attend to all the details of their business. To the Editor of the "North-China Daily News." Sir,–Most people will agree with your leader of today's date on the above subject. No doubt the changeableness of Shanghai weather has something to do with the want of accuracy of most out-door clocks, but I there is one in Nanking Road which may be depended upon, namely that outside Messrs. Ismer & Co's. This timekeeper has faithfully served the public for something like twenty years, and it is not affected by the weather, for it is regulated electrically by a standard clock inside the building, and it has, so far as I can remember, never failed in its duty except when stopped for repairs. Goldsmiths, Silversmiths, Jewellers and Engravers. 90, Queen's Road Central, Hong Kong. Chronometer, Watch and Clockmakers, Jewellers and Opticians. 36, Nanking Road, Shanghai. This German business was founded in 1864 and was still listed in Shanghai city guides for the year 1909. An alternative address noted was 2, Keangse Road (Xin Kai He Road). Vrard & Co. were also known as 'Hengdeli' (Hang-Dah-Le), as shown at the bottom of the 1889 advertisement. Another source states that L. Vrard & Co. were founded in 1860 under the name of Laidrich & Vrard and they began operations in 1862 in Tientsin and shortly after that in Shanghai (the 1864 date above may refer to the opening of the Shanghai branch). Another branch was opened in 1889 in Hangkow and another later in Hong Kong. But, I have noted a charitable contribution from a 'L. Vrard & Co.' to a Chinese hospital run by The American Episcopal Mission from as early as 1849. The visitor to Hongkong who passes along Queen's Road Central for the first time cannot fail to be attracted by the number of well-equipped and tastefully arranged Chinese silver and jewellery shops. Among these, none has been established longer or enjoys a higher reputation than that owned by the firm of Wang Hing. The business was founded by the father of the present proprietors in 1854. It occupies a central position, but notwithstanding this advantage, the large measure of public favour which the firm enjoy would not have been secured unless the articles offered for sale had always been of first-class quality and workmanship. The firm supply every year numerous cups and tropies for local races, and are entrusted with a great deal of the silverwork required by local societies. They may always be relied upon to execute commissions with good taste and dispatch. Nanking Road, Shanghai. Des Voeux Road, Hong Kong. Quay Street, Sydney, and Canton. The Wing On department store in Shanghai opened its doors for the first time on the 5th September 1918. It was the fourth department store to have been built in Shanghai and opened up less than a year after their great rival The Sincere Company opened their department store. The Wing On Company had been formed by the Guo brothers, an Australian Chinese family, they started building their empire with a fruit company in Sydney in 1897. This successful venture was followed by an unsuccesssful venture into a shipping line working the route between Australia and Hong Kong. But Hong Kong was to prove the start of their real success when they opened their department store there in 1907. Although they were department stores, much of what was sold was of self production, they employed many skilled workers and also financed factories whose output became solely for that of the Wing On Company. The Wing On store in Shanghai was nationlised in 1949 and renamed No.10 Department Store, It resumed its former name in 2005, but it is no longer involved in the silver trade. The above advertisement was for Wing On's Hong Kong store situated at Des Voeux Road and Connaught Road. As can be seen the Managing Director was J. G. Lock, the Chief Manager P. Gockchin and the Sub-Manager D. Jackman. 172, Queen's Road Central, Hong Kong & Nanking Road, Shanghai. The Sincere Company's history is an amazing duplicate of that of the Wing On Company. Founded in 1900 by Ma Ying Pew (1860-1944), the Ma family were Australian Chinese who formed their store business from the profits of their Sydney fruit company. Following the success of their first store in Hong Kong, they opened their department store in Shanghai on the 20th October 1917. Like Wing On, they are still in business today, but no longer involved in the silver trade. I'm not 100% sure if the above two advertisements relate to the same firm, but the type of business and the dating fit. If so, as can be seen, Sincere Co. had New York premises at 16-18 East 30th Street. Silversmiths and Jewellers. 432, Nanking Road, Shanghai. Lao Feng Xiang were established in 1848 and are probably the oldest silversmiths still working in the trade in China. They now have sixty stores and four factories producing a wide variety of jewellery and silverware. Established in 1874, this firm carry on business as general storekeepers, silversmiths, jewellers, saddlers, drapers, outfitters, wine and provision merchants, and tourist's providers. A specialility is the manufacture of the Peking enamels, so greatly admired. Insurance is also effected, the firm being agents for the Hamburg Fire, Magdeburg Fire, Mannheim Life, Netherlands Life, and Equitable Life Insurance Companies. The capital of the firm is entirely German. The proprietor is Mr J. Kruger, and the manager Mr H. Westphal. Peter Arnt Kierulff was born in Denmark, he arrived in China, aged 21 years in 1859. He was the first foreigner to be allowed to open a shop in Peking and for many years this business was the main commercial link to the outside world. As can be seen from the above article, by 1908, the business was in German hands. Peter Kierulff was born 18th February 1838 and died 9th June 1909. He was married to Frederikke (Frida) Wilhelmine Francke. 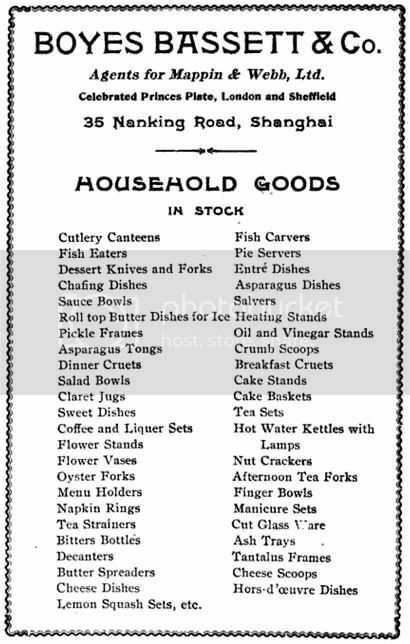 Electro-Platers, Gilders, etc., 148, Boone Road, Shanghai. The works of this firm have no parallel in China, and are one of the most interesting establishments of skilled labour in Shanghai. Equipped with a very up-to-date plant of machinery and appliances for nickel-plating, silvering, gilding, bronzing, oxidising in artistic colours, lacquering, and every operation pertaining to the avocation represented, the work is performed with equal skill and excellence to that obtaining in similar establishments in Europe or America. The motive force of the machinery is supplied by one of the celebrated original Otto-Deutz petroleum engines. In the interior the roar of the polishing and burnishing machines is deafening, and it is an interesting and instructive sight to watch the busy workmen converting the dull or tarnished aspect of articles of every kind of metal into gleam and glitter by means of wonderful and ingenious appliances, and a sight, too, that testifies to the increasing complexity of local industrial activity. The business is a great boon to the community, especially to housewives, hotel-keepers, shipmasters, etc., who are enabled through its splendid resources and facilities to keep their cutlery, plate and table service, cabin, gas, and electric fittings in shining and spotless condition at a very modest outlay. The firm's extremely low prices might well be raised in view of the high-class work they produce. But this, of course, they will not do, wisely preferring the certain benefits of a larger patronage at low prices than to experiment with higher charges and less extensive trade. Messrs. J. Koplin and Co. were formerly established for about ten years in Rangoon, and commenced their business in Shanghai in 1903 in premises in Chappo Road. The large development of their business, especially their new installation for electro, zinc, and tin-plating–a work not done before in the East, and highly appreciated by shipbuilders and engineers–compelled them to remove about the middle of last year into their present more commodious establishment in Boone Road, where, by means of their facilities and resources, they are in a position to execute the most urgent or extensive orders with the utmost promptitude and in a manner that cannot fail to give the highest satisfaction. TUCK CHANG & Co. Ltd.